Following on from Chemishield’s introduction to the Irish Software and Technology ecosystem in April with Dublin Tech Summit, the following months have brought strong growth and development to our world first software platform project. Engaging with clients from North Carolina to South Queensland, the Adriatic Sea and our great Emerald Isle in between; we have brought onboard a full time development team led out by our newly appointed CTO, John McGovern; set up new office space in close proximity to our sister company Aphex at Arc Labs Innovation Centre in Waterford, and in the midst of all this activity we have been bestowed with an unexpected yet massively gratifying honour by our peers and partners in the Irish Pharmaceutical Industry. 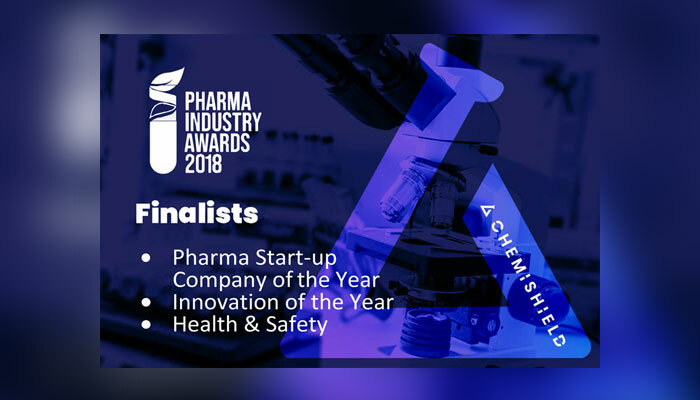 Chemishield has been shortlisted as a finalist for the Pharma Industry Awards 2018 in not only one but three categories: Pharma Start-Up Company of the Year, Innovation of the Year and Health & Safety Award. Further finalists within the categories of Innovation and H&S include global powerhouses such as MSD, Alexion, Eli Lilly, Pfizer, Amgen and BMS – to compete with these industry leading multinationals is something that makes us very proud of the fact that we have not only developed a world first innovation that safeguards labs and associated personnel but that our software’s wide reaching applications and features can provide the aforementioned global giants with the ability to further fortify their own inhouse health and safety procedures and to foster cutting edge innovations in the world of computer systems and automation meeting regulatory and business requirements globally. • Mitigating risk related to lost time in laboratories due to shut down and related costs to research & development, production, education etc. • Chemishield is sold as a minimal risk, stand-alone, cloud-based technology offering. Ireland is a thriving global hub for indigenous and international start- ups, the life sciences and technology/software sectors play a seismic role in developing our economy, here’s our story to date. Chemishield has developed its technology and team to date by means of self-funding and the use of several Enterprise Ireland supports and a partnership project. Our software project has been carried out in conjunction with The Telecommunication Software and Systems Group (TSSG) an internationally recognised centre of excellence for ICT research and innovation, as well as the Pharmaceutical and Molecular Biotechnology Research Centre (PMBRC) an applied research centre which aims to support the sustainable growth of the pharmaceutical and healthcare industry. Chemishield is now ready for market deployment and has already to date been successfully demoed to several global pharma companies with discussions advancing to procurement of the software. Chemishield generates revenue through licensing via direct channels marketing to pharma companies on an annual basis (recurring revenue model). Pricing for the software is based on the number of users per license as well as further pricing structures for single site or global sites licensing model. Additional features/innovations throughout the product lifecycle will be chargeable to the client if they wish to avail of them and will be factored into the cost of the license. Chemishield has built out a strong technical and pharma industry experienced team to support the greater than anticipated demand for the software and is now further expanding its team in core application development, global customer service and environment support development roles. In addition to these development roles ancillary jobs in localisation roles to support foreign languages and sales and marketing driving the growth of the company. Chemishield plans to create up to 30 jobs in Waterford over the next 3 years. So, as we head for the Clayton Hotel on Burlington Road on the night of the 23rd October, we do so with the core focus to safeguard pharma professionals and facilities globally, rub shoulders with some industry giants and who knows maybe even bring home some silverware to County Waterford – Up the Deise!